There is nothing I like better than a Christmas tree absolutely filled with homemade decorations and over the years we've made so many that the tree is looking fantastic this year. Of course I'm not ready to stop and we've just made the prettiest snowflakes to add to our collection. First we made our clay by mixing together 2 parts of corn starch to 1 part white glue. We put it all in a big mixing bowl and take turns mixing it all together until we get a nice consistency, then we have to get our hands in there to really squish it all together. It takes a little while to get the clay really nice and smooth, but it is definitely worth all of the kneading to get it perfect. Then we get out the rolling pins and each of the children takes half of the dough to roll it out to about 1cm thick. Then we use our snowflake shaped cookie cutters to cut out our shapes and carefully push them out of the cookie cutters without breaking the edges. Then we use a drinking straw to push a hole through the top to thread the string through. We left our snowflakes to dry overnight and the next day we used our new Chalkola chalk markers to decorate them. The chalk markers are made to be used on non-porous surfaces (like chalk boards and glass) so that they can be wiped off, but I really like using them on porous surfaces like clay so that they sink right in and don't wipe away, but look lovely and soft like chalk. I think it's the perfect effect for our snowflakes. The children really enjoyed using them as it was something different and they had more control over the way that they coloured the snowflakes rather than using paint brushes. 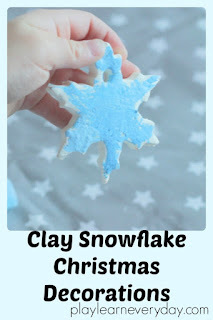 Then as an extra added touch I got Ethan to write his name on the back of the clay snowflake decorations that he made so that we'll be able to look back on decorations over the years and see the progression of the kids writing as well. 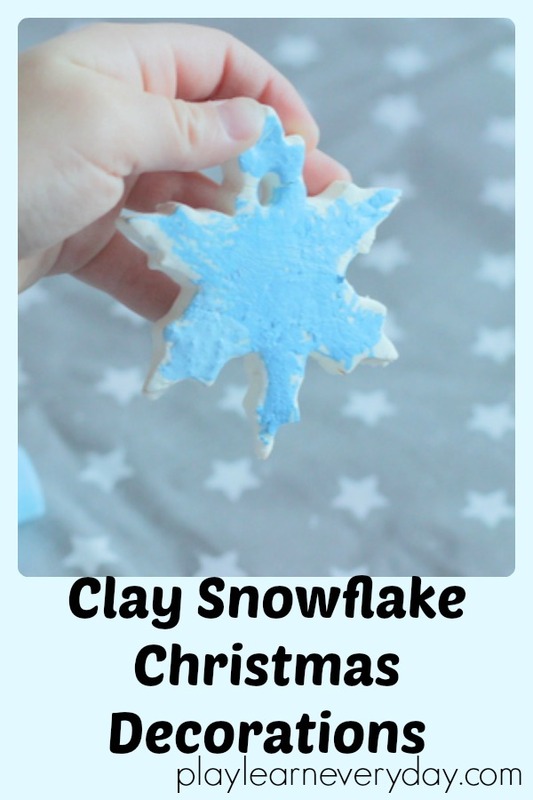 Take a peek at some of our other Christmas crafts, games and activities!